In the Hunger Games movie, a silver parachute is air dropped to the story's hero, Katniss. It saves her life for it contains humanitarian aid. That's not fiction though for starving people in South Sudan, who have food air dropped to them by the UN World Food Programme (WFP). 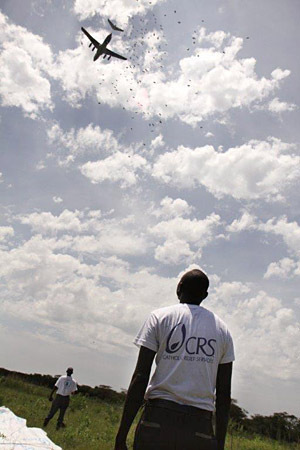 Catholic Relief Services (CRS) distributes these life-saving "silver parachutes" to thousands of war victims who have been displaced from their homes. The CRS team sets up these food stations deep in the bush. Brigid O'Connor of CRS says this grueling work is carried out amid snakes and mosquitoes carrying malaria. These heroic actions can only take place if there is enough donations. 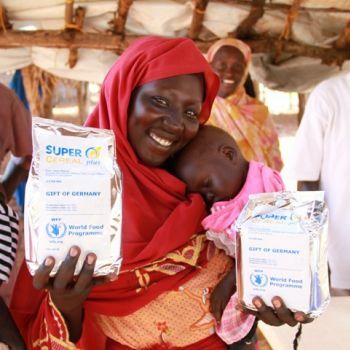 The U.S. Food for Peace program is the largest donor of this food aid. The government decides each year how much funding to allocate toward Food for Peace. This year President Obama has proposed $1.4 billion as the funding level. In contrast, nuclear weapons spending exceeds $30 billion a year, at least. Wouldn't we rather send more food to the starving peoples of the world rather than investing in Cold War relics? You are almost certain to find other examples too of money better spent on food aid. Surely the administration and Congress can do a better job on the budget regarding Food for Peace. South Sudan is one of the countries where food is needed the most. The African nation is on the brink of famine. Fighting between the government and its opposition has destroyed food supplies. Civilians have been sent fleeing for their lives. The Norwegian Refugee Council says, "People are being displaced across their country, unable to work, unable to plant and unable to live in safety and security." Imagine if war came to your community. What if you lost your whole income and food supplies became more limited each day? Farms and factories that supply food could no longer function because of the violence. Things we might take for granted would start to disappear. That is the reality that people face in the war-torn lands. South Sudan is experiencing the worst of these nightmares. The charity Oxfam says, "We are seriously concerned that a lack of food may peak in May and June reaching emergency levels. If we wait until then, it may be too late." Food not only saves lives, but it gives people hope. It gives communities, whether in South Sudan or other countries, a chance to build peace. Wars in Syria and Iraq, as well as instability in Yemen, has also created a massive hunger emergency in the Middle East. Worldwide, there are more people displaced by war than any time since World War II. They are hungry. They need life-saving food that can rescue their child from the deadly malnutrition. Malnutrition is always the partner of war. We can save them, if we have the will. We can increase and strengthen the Food for Peace movement. It all starts with you, speaking out and sending someone a "silver parachute" and food and hope.